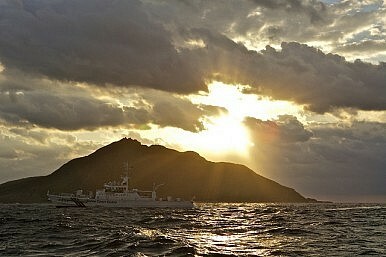 A Coast Guard patrol vessel passes by Uotsuri, the largest island in the Senkaku/Diaoyu chain. After much speculation it appears that the two sides have found sufficient common ground to meet. On November 7, Japan and China revealed they had reached an understanding on their differences that would allow for a resumption of diplomacy. After several years of a virtual shut down in bilateral talks, Japanese Prime Minister Shinzo Abe and Chinese President Xi Jinping are preparing to meet face-to-face at next week’s APEC meeting. Economic needs may be driving Xi, but strategic concerns are on the top of Abe’s agenda. Neither government had experience handling the military tensions thatgrew along with the worsening territorial dispute. By the end of 2012, Chinese planes began to fly near (and at times above) the territorial airspace; Japanese jets scrambled in response. Japan clarified its air defense rules of engagement, telegraphing to Chinese aircraft how it would respond to incursions into Japanese airspace. A Chinese naval vessel locked its fire control radar on a Japanese MSDF ship, promptinga formal protest and a Chinese Ministry of Defense investigation into what happened. And in November of 2013, the Chinese MOD announced it would enforce a new Air Defense Identification Zone (ADIZ) that overlapped with Japanese and South Korean ADIZs. There has been no contact between Abe and Xi to date. Indeed, very little diplomacy has been possible, leaving many worried about the lack of available channels for managing crises. While the two countries had begun to consider risk-reduction measures after the 2010 fishing trawler incident, including a hotline between defense officials and a maritime dialogue involving various government agencies, the eruption of severe tensions in 2012 precluded their realization. Political transitions in both countries also contributed to the lack of diplomatic initiative. Xi Jinxing’s arrival to power in Beijing and the return to power of Shinzo Abe and his Liberal Democratic Party in Tokyo meant that the two leaders had no personal ties and that the new governments needed time to develop their thinking on how to restore balance to Sino-Japanese relations. The economic interdependence between Japan and China continues to ground the relationship, although in recent months the rate of Japanese investment in China has diminished. Two-way trade wass valued at over $300 billion in 2013. This year the amount of FDI from Japan, valued at $2.83 billion through July remains high relative to other foreign investors, including the United States, which only accounted for $1.8 billion of Chinese FDI. But overall foreign direct investment in China slowed by 17% in the first half of 2014, and Japan’s FDI was 45% lower than in the previous year. Japanese companies are increasingly diversifying their global FDI with China only attracting 5% of outward Japanese investment in the second quarter of 2014.